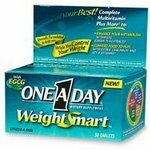 I bought Weight Smart™ Dietary Supplement Tablets because I was little overweight and I thought this would help me. Of course, I didn’t expect to see results in a day but after using the product for about 1 month, I would expect to see a small improvement. I didn’t see any results and I was very disappointed. Expensive with no results at all! I bought these because I thought they might help me with my metabolism and I didn't see an increase at all. They do work well as an everyday vitamin though. I think the point of the product is a supplement, not a diet pill. It combines the vitamins we would normally take with some extra green tea, which in itself has been proven to aid in weight loss. The key really is to take this vitamin while exercising and eating healthy. On its own, it isnt going to make you lose weight, no pill out there will. I stopped taking multivitamins for a while and am a bit over weight so I figured I would try "weight smart". I didn't not see nor feel any results for several weeks and decided to switch to a cheaper plain old generic brand vitaman. It did not increase metabolism or produce any noticeable weight loss results. I bought these when I saw them in the store and wanted to give them a try. I thought they would be something good to try to help boost my metabolism. Work the same as a normal daily vitamin. Didn't have any effect on weight loss at all.